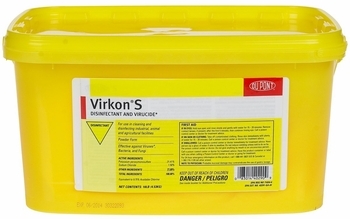 Virkon-S powder 10 lb (+ freight) is a broad spectrum disinfectant that is effective when in solution at low temperatures, hard water, on porous surfaces and in the presence of organice matter. Starts killing bacteria in 5 min. Use 1.3 to 2.6 ounces powder per gallon of spray. 10 lbs will make 60 to 120 gallons of spray.